What a fun challenge we had last week with all of your awesome creations, thanks for the inspiration and playing along with us! Our challenge this week is Layers! We challenge you to make cards for our heroes to send home to their friends and loved ones using 2 or more layers. We are looking forward to seeing your creations! We have a sponsored challenge this week! The Stamp Fairy will be awarding a very generous prize package to one lucky winner this week. You’ll have until Tuesday, April 19, 2011 at 7:00 PM MST to enter your card, a winner will be announced at the beginning of the next Midweek Throwdown challenge! Stamp Fairy officially launched on November 5th2010. Gerda, artist and owner, creates cute and whimsical digital images for the young and old, inspired by her life, love and 4 cute cats. You will find adorable teddies bears, young boys and girls to fuzzy little bunnies and whimsical critters. 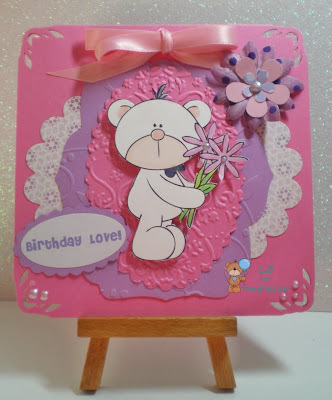 Stamp Fairy has new releases along with a free image every Friday, a weekly challenge on Mondays and Guest Designers each month on their challenge blog. Please visit the store and browse The Stamp Fairy’s wonderful images. Our sample card makers this week are The Stamp Fairy’s design team, to see more of their fabulous artwork please visit The Stamp Fairy blog. Oh, yay! Layers are so fun, and a great way for me to use up some of my pop-dots! Thanks, Jan! All of the samples are ADORABLE! !